Core Summary: A Harvard University affiliated core facility supported by the Center for AIDS Research (CFAR). 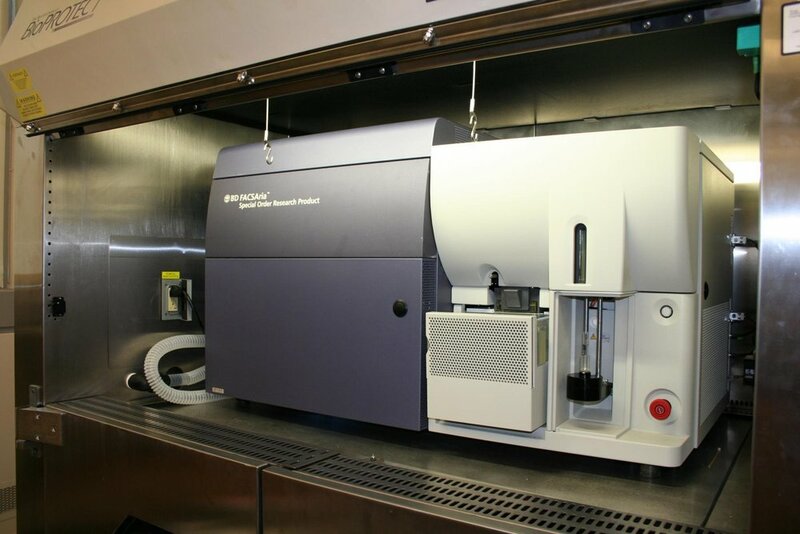 The Cytometry core provides Equipment consultation, and data analysis overseen by dedicated personnel. The same services are also available to outside researchers. Our expertise includes Non-Human Primate (NHP) research, and infectious diseases. The Core team is committed to continuously expand with the latest software and lasers to better assist peer researchers. For online scheduling, please click below! COMS approved facility allows for sterile sorting of fixed and unfixed human, non-human primate, and other animal specimens for HCV and HIV/AIDS research. BD FACS Aria II cell sorter equipped within a Bioprotect IV LE biosafety cabinet operates with 4 solid state lasers: 405nm violet measuring up to 8 parameters, 488nm blue measuring up to 2 parameters in addition to FSC and SSC, 532nm green measuring up to 5 parameters, and a 628nm red measuring up to 3 parameters, allowing sorting panels of up to 18 fluorescent markers.